Abuja, Nigeria – There has been one single promise that has dominated the election manifestos of Nigeria’s presidential candidates as they seek to lure the support of the country’s voters ahead of polls in February: jobs, jobs and more jobs. This has also been the one issue that has consumed Immaculate Uba, who lost her bank job two years ago. 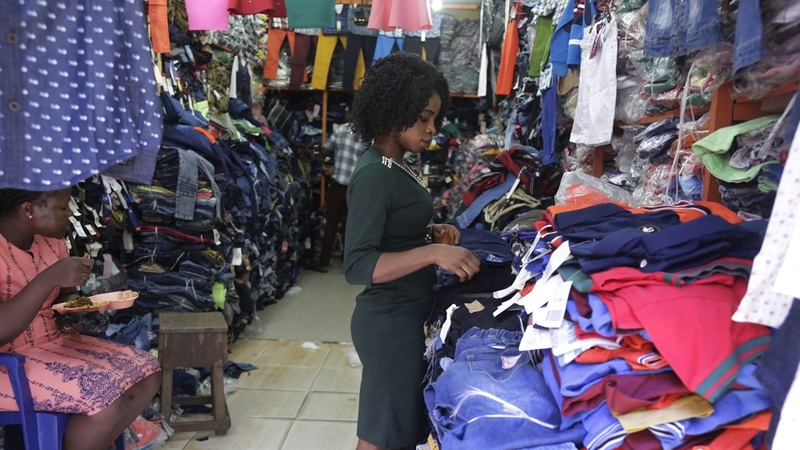 “It has been a horrible experience I never expected in my life – knowing fully well that you are willing and able to work but can’t secure a job,” she told Al Jazeera in Nigeria’s capital, Abuja. “I am still searching for a paid job,” she says. In the meantime, she adds, she’s trying to make a living by doing bead- and shoe-making work. Four out of every 10 people in the the country’s workforce are either unemployed or underemployed. The unemployment rate stood at 18.8 percent in the third quarter of 2017, with underemployment at 21.2 percent. The National Bureau of Statistics has not released new jobs data since last year, prompting accusations by critics that this is due to political reasons. Meanwhile a number of companies have exited Nigeria in recent months – the latest being global banking giants HSBC and UBS. South African casino and hotel operator, Sun International, is also close to shutting operations after its earnings were “hurt by subdued growth and one-off costs”, the company said. Analysts have blamed the exits on shaky investor confidence, dealing a big blow to foreign direct investment and jobs in Africa‘s most populous nation. “Nigeria‘s unemployment level is beyond crisis levels, and ought to be the government’s top concern as it has social implications,” Cheta Nwanze, head of research at Lagos-based SBM Intelligence, told Al Jazeera, describing the joblessness figures as “unsustainable”. Amid this environment, thousands of young Nigerians are seeing the prospects of landing their dream job fade. “I had hopes of a very bright career after graduating from university,” says Agnes Uzoigwe attention, a 28-year-old who took her geology degree six years ago. “I looked forward to a job with an oil company in the Niger Delta area but after almost four years of applying for different roles, I got frustrated,” she adds, fighting back tears. “The most annoying thing is that it looks like there’s no hope. Those employed by companies are being sacked and people like me with no job experience can’t even imagine getting any job,” she adds. Uzoigwe’s father, who funded her studies, recently retired as a government employee and is relying on his pension to cater for his family of seven. After a long period of searching for a job in Abuja, Uzoigwe has now taken up a job as a teacher in a private college. But she says her wage is barely enough to take care of her basic needs. Nigeria is Africa‘s biggest economy, yet this that has not translated to jobs for many. Frustrated and desperate, many job seekers have often fallen victim to fake hiring firms which cash in on their need to get a job. These companies advertise positions with attractive offers, but end up swindling job seekers who are asked to pay “registration and logistics” fees before landing a job. “With the school system adding roughly a million people a year to the workforce, and a very high birth rate, this represents Nigeria’s biggest challenge,” Nwanze, the analyst, says. “Frustrated people will eventually turn to demagogues for their daily bread,” he adds. The country’s worsening unemployment situation has negatively affected the government’s image. President Muhammadu Buhari won the 2015 elections on the back of a campaign vowing to fix the nation’s economy, but has struggled to fix the worsening economic crisis. Now, ahead of the February elections, he is promising to generate more employment. “The next level of effort focuses on job creation across various sectors,” Buhari said in his election campaign’s policy document. His main challenger for the presidential election, Atiku Abubakar, has attacked the government’s job creation record since Buhari assumed office four years. “Close to 16 million people are unemployed, nine million more than in 2014,” Abubakar said in his own campaign document. Abubakar has promised to remedy this with “the creation of up to three million self- and wage-paying employment opportunities in the private sector annually”. Iniobong Paul, a hotelier who lost her job two years ago, told Al Jazeera she hopes that the political promises will be realised after the elections. “It’s not been easy,” she says, adding that she looks forward to working again.